Malayala Manorama Weekly, being the largest circulated weekly magazine in India has published the 5th July 2014 issue. 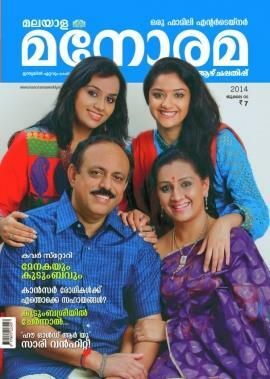 The highlight of this issue would be the interview with producer Suresh Kumar and wife actress Menaka. Other than regular columns, Pranayathira by Harikrishnan would make this issue delicious. An exclusive feature of 'How Old Are You' sarees finds its place in this issue. The sarees wore by actress Manju Warrier has already become a trend among the women in Kerala. The marketing techniques used by the sellers have clicked to the target with sales rocketed. An interview with producer Suresh Kumar and his family would grace this issue. Talk with Suresh kumar, Menaka Suresh and daughters Revathi and Keethy Suresh would be much special for the readers who get an insight among the family. Other features are the regular serialized novels, Cartoons, Jokes, utility columns, stories for children, cinema section, comedy sections, recipe sections, short stories and original personal stories. Astrological predictions, answer from the doctor, poems, kids sections gives full satisfaction to its readers. Thickly packed with interesting stories, each issue of Manorama is worth for money. With a circulation of more than 6 lakh prints, Manorama Weekly is truly a companion of teenagers and readers of other ages. Malayali community living around the world, keep updated themselves reading the content of the weekly through its digital edition. Creamed with inventive content, this magazine gives refreshment from top to bottom. Manorama weekly which comes with an affordable price has already become the favourite among the common man. A team of hardworking intellectuals working behind the screen should be well appreciated for their dedication for delivering the best content for the readers. This weekly is highly recommended to passionate readers who want to keep freshness all day. So don't miss the current issue of Malayala Manorama Weekly which can also be read online.